We recently released Update #27 on the Test Server, which included lots of changes, including the new MP5K SMG, Survivor Pass 3, and changes to the Survival Title System for season 3. In addition to these, we made quite a few changes to gameplay balance and wanted to go a little more in depth on our thought process behind those in this Dev Letter. Update #27 is the first major balance patch of 2019. We introduce balance patches such as these to keep the game evolving and prevent gameplay from becoming stale. Our goal is to release a pretty major balance patch roughly once per quarter, to provide a more diverse PUBG experience and keep the game evolving and feeling fresh. 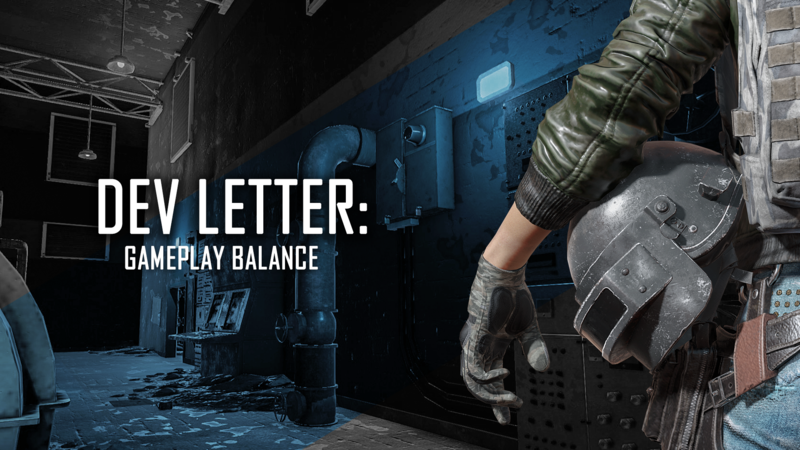 Let’s take a look at some of the major changes implemented with this balance patch. Aim punch is a type of camera shake that is triggered by getting hit and momentarily offsets player's aim point, and is used to simulate the realistic effect that being struck by a bullet would have on your aim. We have done multilateral analysis of our aim punch system, including taking in lots of player feedback, and concluded that it needs to be adjusted to generate less impact on gameplay while keeping the effect to some degree. In the past, getting shot applied a considerable penalty on long range aiming, especially when using high magnification scopes. With the update, players are now able to readjust their aim and find their target faster. For short range aiming, previously, aim punch could potentially lead to losing the entire fight just because you were hit first, which would sway your full auto burst away from the target. With these changes, players should see fewer instances of this, as the effect of aim punch has been reduced by around 50% of what it used to be. However, remember that aim punch penalties are harsher when not wearing armor, so be aware of this if your helmet or vest happen to break. In terms of attachments, we decided to undertake a couple of actions to reduce the loot clutter in the game. As of this patch, Pistols and SMGs now utilize the same attachments, significantly reducing the overall attachments in the loot pool. This change will also be accompanied by a greater number of AR and SR attachments spawning in the world. Along these same lines, we merged shotgun and bullet loops into one single item that can be used on both shotguns and sniper rifles. Finding this type of attachment should now be much easier, especially when you need it on your Kar98k or lever-action rifle. Since this change has removed several items from the game, we have filled in that loot gap by increasing the quantities of overall items spawned. While the quantity increase was evenly distributed across all other items, a few items that are more highly desired received a greater amount of increase, such as ARs, heal/boost items, and equipment. Exceptions to this quantity increase were level 3 helmets and flare guns, which could drastically alter the game experience even with a small quantity change. The main purpose of this adjustment is to provide a better gameplay experience by increasing the quantities of major items while keeping the items that have a huge impact on gameplay to the same level. We’ve also made a few changes in the weapons department. SMGs will now deal more damage to limbs to improve their short range effectiveness, whereas sniper rifles will deal significantly more damage to the torso, being able to one-shot kill unarmored targets (except for Win94). Apart from that, we decided to swap around the calibers of two sub-machine guns; the Vector and UMP. This is to make them more realistically accurate damage wise, as well as to improve the usability of the Vector by giving it a larger magazine capacity. While the damage of the Vector has been reduced slightly to 31, it still remains a very capable weapon, now with an increased default magazine capacity and being able to fire up to 33 rounds quickly with an extended magazine. This change also means that very long bursts with the Vector will now be a little easier to control. Last but not least, we’ve added the tactical stock attachment to the Mutant and the M16A4, making them easier to use as "tapping weapons." The latter also had its recoil reduced on the initial shots of burst mode, making it more deadly in CQC scenarios. Finally, we decided to change the way the first aid kit works in the game. Instead of restoring you to 75% health immediately after the use timer, the healing will now apply over 2 seconds. This change will make it a little more difficult to immediately re-engage a target after you’ve applied a heal, so finding good cover is recommended before you take the time to heal. If you are on the attacking side of things, this gives you a little more time to close the distance on a recovering enemy while they wait for their health bar to fill. We are looking forward to seeing how this changes the dynamics of firefights and are eager to hear your feedback on how this feels as a player. These balance changes put more emphasis on PUBG’s core gameplay elements, and are intended to boost playability while offering a fresh gameplay experience. We expect there to be a lot of varied feedback for this update and understand that balance changes such as these can be a touchy subject. As always, any and all feedback is welcome and will be the basis of which we decide future directions for PUBG. Hop in-game, check out the changes, and let us know your thoughts!